Hypoglycemia is frequently found among people with diabetes. Dr. Gopika Gangupantula can help mediate your low blood sugar through insulin management and can perform data interpretation to prevent further episodes. 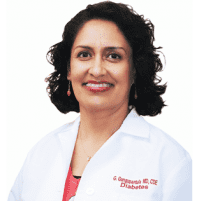 Schedule a visit to Valley Diabetes & Obesity in Modesto, California to consult with Dr. Gangupantula about this condition that can be managed. Low blood sugar, or hypoglycemia, is a common effect of having diabetes since your body doesn’t have enough sugar to use as energy. The condition can be triggered by diet, certain medications, exercise, or other health conditions. What are symptoms of hypoglycemia? Contact Dr. Gangupantula as soon as you notice any symptoms of hypoglycemia. Drinking alcohol or taking certain medications with your diabetes medications can also trigger a hypoglycemic occurrence. If you feel as though you may be affected by hypoglycemia, constantly check your blood sugar level alongside your diet. If your levels tend to drop after eating sugary meals, it’s recommended you change your diet to avoid sugary foods and frequently eat small meals throughout the day. A drop in levels when you haven’t eaten means you should have a protein or carbohydrate-filled snack before bedtime. After evaluation, Dr. Gangupantula may also suggest lowering your insulin dosage or changing the time of your dose. She can also interpret available data to prevent further episodes. How can I prevent hypoglycemia from occurring?